To celebrate the release of Ubuntu 10.10 Maverick Meerkat today, a new Ubuntu Tweak version is available for download - 0.5.7. 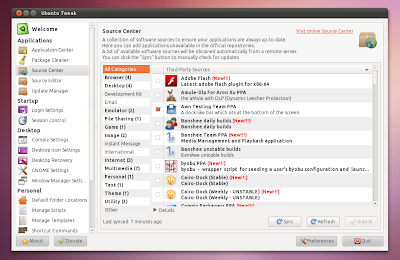 This new version comes with some bug fixes and small improvements, but most importantly: it includes new / updated PPAs for Ubuntu 10.10 Maverick Meerkat. A complete list of changes can be found @ Ubuntu Tweak blog. The new / updated PPAs in Ubuntu Tweak 0.5.7 include: Adobe Flash 64bit, Cairo Dock (stable and unstable), DeadBeef, Elegant Gnome, Firefox Daily Builds, Glippy, Gwibber Daily, Hotot daily, Lookit, qBittorrent, Chromium Beta Channel and Dev Channels PPA (along with the existing Daily builds PPA), Wine, Pdfmod and many more. So if you're looking for a quick way to set up everything on your fresh Ubuntu 10.10 installation, use Ubuntu Tweak. 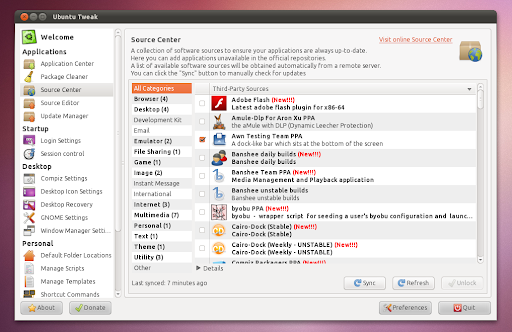 Download Ubuntu Tweak 0.5.7 (installing the .deb will automatically add the Ubuntu Tweak PPA).